NEW YORK (CNNMoney.com) -- Burger King said Thursday that it has agreed to be acquired by investment firm 3G Capital in a deal valued at $4 billion. New York-based 3G Capital will buy the fast food chain for $24 a share. 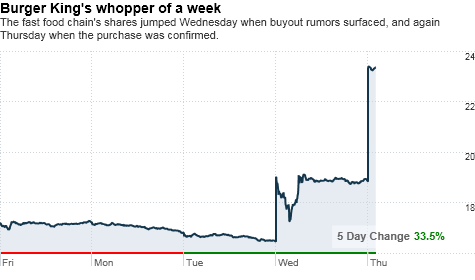 That marks a 46% premium over Burger King's closing price of $16.45 on Tuesday, the day before news reports said the company was up for sale. Burger King (BKC) shares rose almost 15% Wednesday after a Wall Street Journal report said 3i Group, based in London, was preparing to buy Burger King. But the Journal retracted that statement later in the day after 3i refuted it. After 3G Capital confirmed its purchase, the fast food chain's shares were up another 24% to trade at $23.40 Thursday. Burger King's board of directors has already approved the deal, which is slated to close during the fourth quarter. Burger King's chairman and chief executive, John Chidsey, will remain CEO during the transition and then take on the newly created role of co-chairman. TPG Capital LP, Goldman Sachs Capital Partners and Bain Capital Investors collectively own about 31% of Burger King's shares. Those firms took Burger King private in 2002, but it returned to the public market in 2006. Burger King has struggled more than its rival, McDonald's (MCD, Fortune 500), amid the recession. Last week it forecast weak demand for its new fiscal year, citing high U.S. unemployment rates and government austerity programs sweeping through Europe. The restaurant chain operates more than 12,150 restaurants in all 50 states and in 76 countries.